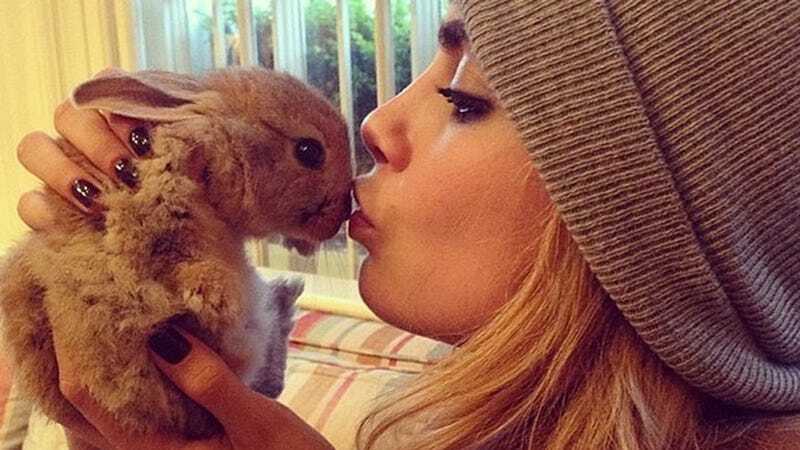 Today in wildly salacious celebrity gossip, Cara Delevingne is rumored to have hired a rabbit nanny for her pet bunny, Cecil. "She never thought a little rabbit would be so much hard work," an insider divulged to British newspaper The Daily Star. "At the moment she simply has too many commitments to give him the full attention he needs. But giving him away is not an option, so she decided an extra pair of hands was the way forward." This is the best contextual use of "divulge" in the history of the English language. Anyway, there is no information about the nanny so you'll have to imagine his/her qualifications and past work experience for yourself. In other Justin news, Justin Theroux spoke to details about some stuff and brooded on the cover. Most notably, he talked about his often speculated-upon relationship with Jennifer Aniston — he says the paparazzi that hound them are annoying, but "You have to center on what its core thing is, which is that you met someone you fell in love with. It's hard to explain. I just find myself wondering, What's the big f–king deal?"